Instructions: Card size is 6 x 6”. 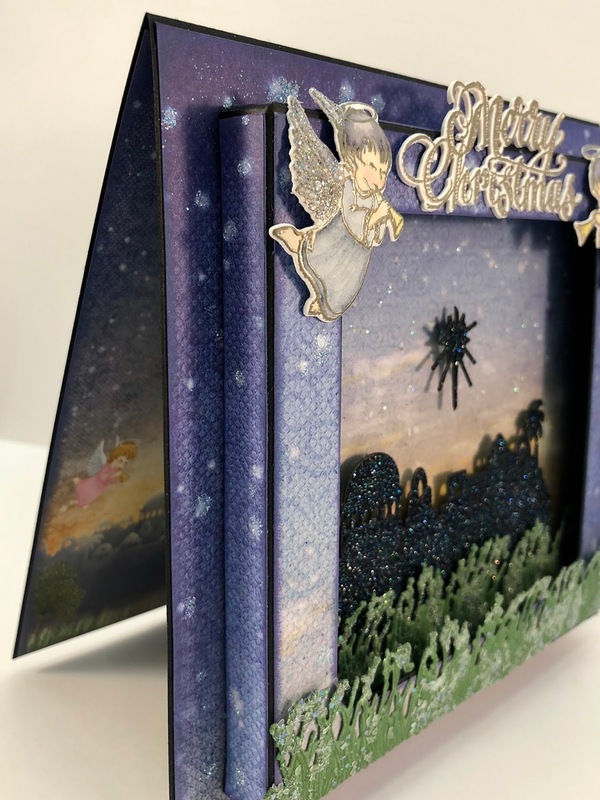 Cut black cardstock 12 x 6”, score on the long side at 6” and fold to create card base. Cut two pieces of designer paper from the collection as shown 5 7/8 x 5 7/8”, ink the edges first with faded jeans and then with wilted violet. Adhere one piece to the card front and the other to the inside of the card using dries clear adhesive. Cut paper from the collection to fit the 5 x 5” shadowbox front, top, bottom, sides and inside back of the shadow box. You will need 2 pieces 4 7/8 x 4 7/8” and 4 strips measuring 4 7/8 x 7/16” each. Use the die from the Cut Mat Create 2A Die to cut the opening in the front. Adhere all of the paper to the shadow box using dries clear adhesive. Stamp the Bethlehem scene and a I x 3 3/4” strip on black cardstock using VersaMark, sprinkle with Heat & Stick powder, heat set using the Heat It tool, sprinkle with the Blue Raven glitter and heat set again. Adhere the city scene to the 1” strip. Stamp the grass from the Wildwood Cottage Accents stamp set four times on green cardstock using Archival Olive ink and die cut. Trim them so that you have two continuous strips, sponge with dries clear adhesive and sprinkle with Crystal Clear glitter. 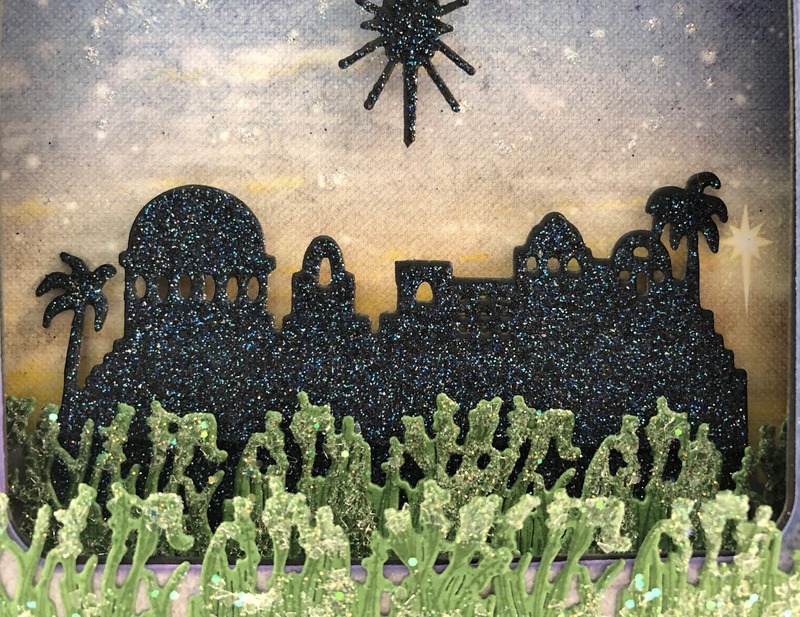 Adhere one grass strip to the city scene and the other to the outside of the shadow box. Adhere the Bethlehem scene with the grass and the star to the inside of the shadow box using dimensional dots. Adhere the other grass to the front of the shadow box as shown. Such a gorgeous card! Your angels, shadowbox and sweet glittery Bethlehem are awesome! Awww...thank you so much Darla! Beautiful and serene nativity scene! 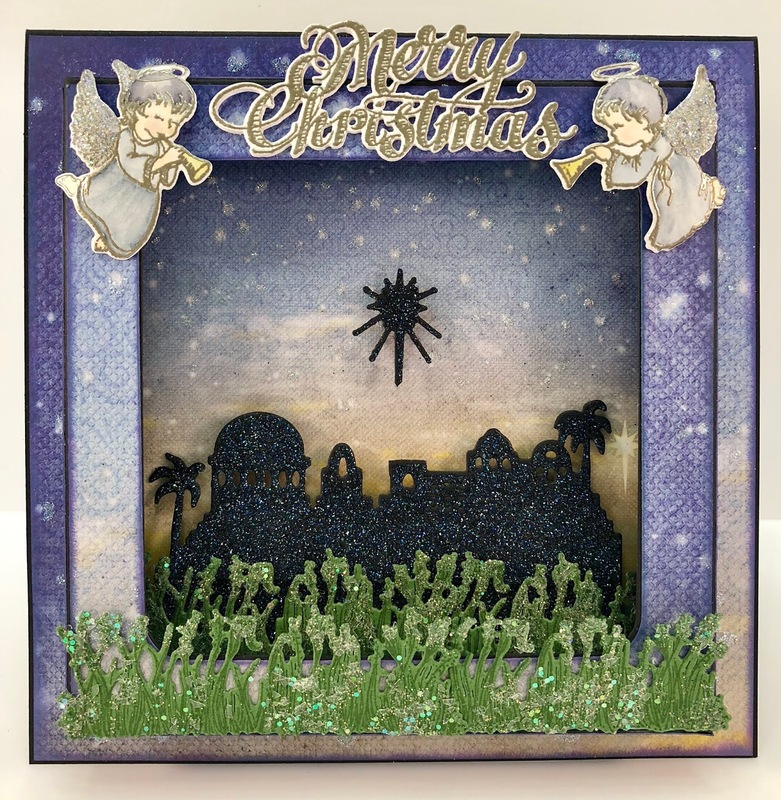 Great shadow box card Janet!! I love how sparkly it is and all the grasses etc., bet the inside is just as beautiful!